Homespun Stitchworks..... For the love of vintage: Paisleys .. Buta! and paisley for me is beautiful in every way. Paisley! ah my soul cry's out for it, I am known in my circle of friends as the paisley Queen! I can spot it a mile off, almost sniff it out and I really truly can not resist it at all. I can say though if I had a good stash of a particular colour of it and saw some more I would leave it for another to enjoy, I do not want to cause vintage paisley shortage single handedly!!!! Firstly Paisley has many names including buta and boteh and the pattern is sometimes called "Persian pickles" by American traditionalists, especially quilt-makers or "Welsh pears" in Welsh textiles as far back as 1888. The twisted tear drop, the kidney-shaped paisley is of Iranian origin, but its western name derives from the town of Paisley, in West Scotland, a centre for textiles where paisley designs were produced. It was often thought of as Victorian but dates much further back than that. 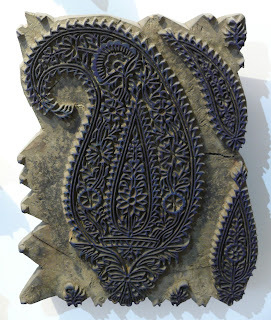 The picture on the left is of an original hand stamp used for paisley printing. Imports from the East India Company in the first half of the 17th century made paisley and other Indian patterns popular, and the Company was unable to import enough to meet the demand. It was popular in the Baltic states between 1700 and 1800 and was thought to be used as a protective charm to ward off evil demons. Local manufacturers in Marseilles began to mass-produce the patterns via early textile printing processes at 1640. England, circa 1670, and Holland, in 1678, soon followed. 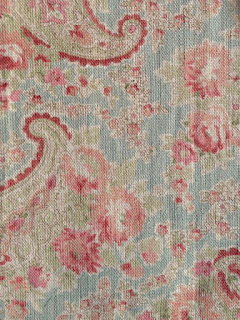 This, in turn, provided Europe's weavers with more competition than they could bear, and the production and import of printed paisley was forbidden in France by royal decree from 1686 to 1759. However, enforcement near the end of that period was lax, and France had its own printed textile manufacturing industry in place as early at 1746 in some locales. 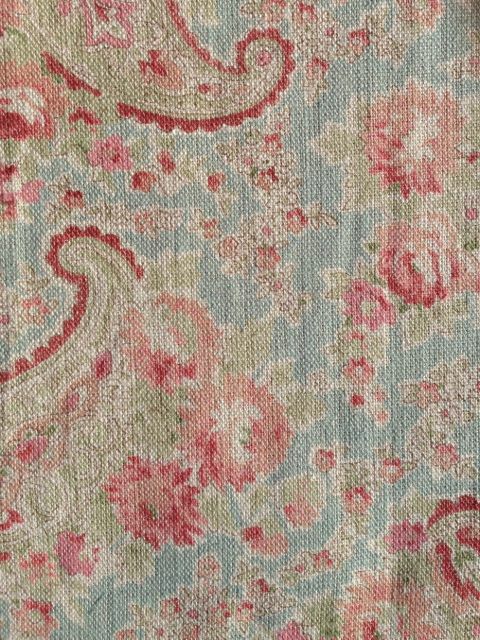 Paisley was not the only design produced by French textile printers; the demand for paisley which created the industry there also made possible production of native patterns such as toile de jouy. cashmere wool shawls from India, and the East India Company imported more. 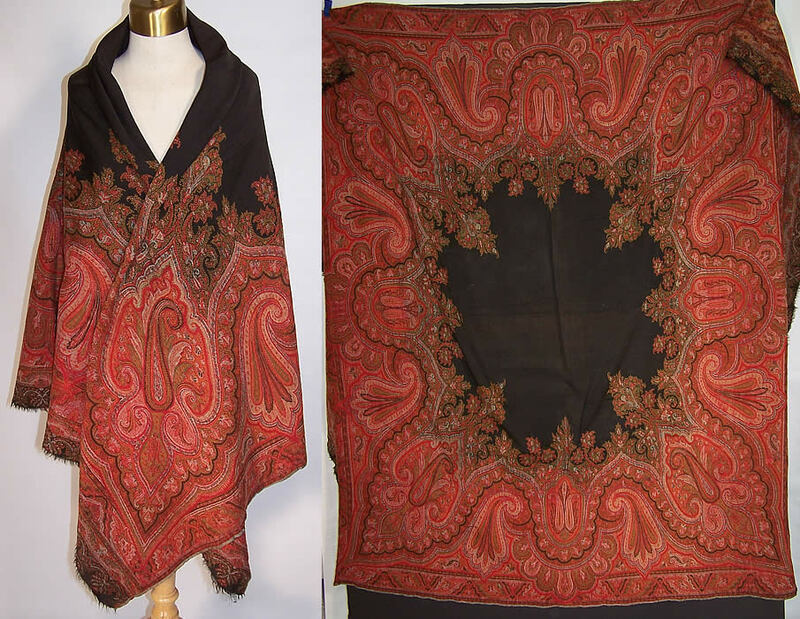 The design was copied from the costly silk and wool Kashmir shawls and adapted first for use on hand looms, and, after 1820 on Jacquard looms..
From roughly 1800 to 1850, the weavers of the town of Paisley in Renfrewshire Scotland, became the foremost producers of these shawls. Unique additions to their hand-looms and Jacquard looms allowed them to work in five colours when most weavers were producing paisley using only two.The design became known as the Paisley pattern. By 1860, Paisley could produce shawls with 15 colours, which was still only a quarter of the colours in the multicolour paisley's then still being imported from Kashmir. In addition to the loom-woven fabric, Paisley became a major site for the manufacture of printed cotton and wool in the 19th century, according to the Scotland's Paisley Museum and Art Gallery the paisley pattern was being printed, rather than woven, onto other textiles, including cotton squares which were the precursors of the modern bandanna. 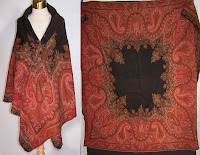 Printed paisley was cheaper than the costly woven paisley and this added to its popularity. The key places of printing paisley were Britain and the Alsace region of France. Well I hope you have enjoyed your tiny trip around some paisley history. I am off to collect my basket of stitching for today so have a great day and Happy Stitching! Thank you it really has been wonderful learning all about it and I am so pleased. It is great learning from you about fabrics, dates and paisleys in general, I am so lucky to have met you and become friends with someone so knowlegable. Mixed media pictures ....... Having a great time! Cross Stitch ... under used embroidery stitch! The Cotswolds Vintage Fair at Toddington. Basket Stitch by Mary Corbet.